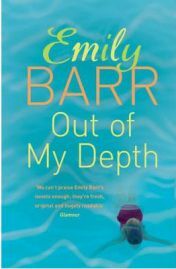 Out of My Depth, by Emily Barr, tells the story of four former school friends who meet up years later for a reunion. Right from the start the reader is aware that something dark and sinister occurred in their past which means that this reunion is never going to be easy – but this is at first only hinted at and gradually through the book the truth comes out. This really had me hooked right from the start! All the women are now thirty two. Suzy, a successful artist is the one who instigates the reunion by inviting the others to her luxurious farmhouse in France. She is very surprised and also more than a bit nervous when everyone agrees to come. The others are Amanda, Isabelle and Tamsin. All have changed greatly since their school days and because of this they are like strangers to each other. As the weekend progresses they reveal more and more of themselves to each other which in some ways makes them closer but in other ways makes them realise just how far apart they have grown. There is a deepening sense of disappointment that they no longer feel they can laugh and confide in each other the way they used to. All four of the main characters are so well developed that immediately you start to feel for them and identify with them. They are not always likeable particularly Amanda who is a rather self centred verging on alcoholic housewife. You can understand her though and actually at times feel very sad for her too. There are quite a few subtle themes within this book too. One is on the issue of children and raising children. Even though only two of the four women have children they all have strong ideas on childhood. The other three are all appalled at Amanda’s child rearing strategy which involves packing her children off to as many extra curricular activities as can be fitted into a busy schedule. Their reaction though is counter balanced by Amanda’s strong belief that she is providing the very best start for her children in an extremely competitive world. Another theme is on weight and about all of the women’s self images. During their school days, this was an issue for most of them and still is as they progress towards middle age. There are even suggestions of bulimia but what it ultimately shows, along with the excessive drinking of alcohol by some of them, that if you are not happy then these things affect you more. It also demonstrates that being thin does not necessarily make you happy. Out of My Depth moves almost seamlessly between the present and events in the past. It’s through these flashbacks that the reader gradually pieces together the dark secret which has been destroying three out of the four of them. Moving into the present, it seems that unless they confront this secret they will never be able to move forward, but they don’t even all agree on this. The novel has a brilliant building up of pace and tension and there is always an ever present sinister undertone which suggests that the weekend is not just going to be a pleasant catching up on everything reunion. The more I read this book, the more I could not put it down – I was well and truly sucked in! There’s a quote on the back cover from Cosmopolitan which describes the book as ‘sleep-sabotagingly moreish’ and that is such an apt description. I just wanted to keep on reading and never mind things like sleep getting in the way! This was the sort of book where the end came just too soon. I was disappointed because, although the ending was as good as the rest of the book (no spoilers here) I just did not want it to finish. I sort of felt lost and I wanted to know what happened after that weekend – maybe there’ll be a sequel! Out of My Depth is a fascinating look at what happens when you meet up with people who once were friends and you no longer know and could quite possibly put you off attending any similar events yourself! I think Emily Barr displays very acute observations in her writing though which almost make you feel like you are there. For me, this was almost a perfect novel with a powerful tense storyline and strong characters. I am very glad I read it and I strongly recommend it if it sounds like the sort of book you like. No Comments on "Out of My Depth"